Recently a friend with an older baby brought around a bag of clothes that included no fewer than six pairs of baby tights. Now, tights are no good for infant pottying (just another thing to try and take off with one hand), so I was about to take them off to the op shop. Then I thought...we really need some more Baby Legs. They're those stretchy leggings you can get for about $20. Our one pair is always in the wash.
A few snips and a bit of simple stitchery later, Umi had some new Long Socks. To make, simply cut off the legs of the tights. The longer the better. Then cut off the top elastic at the waist of the tights. This seems to be, very usefully, the exact length you need to cut in half and use as the top elastic of each sock (depending of course on the girth of your baby's thighs). The elastic is usually folded in half, so fold this over the top of each leg and stitch in place. If the elastic isn't easy to re-use, just use some fold-over-elastic (the kind Spotlight sells for making lingerie). These are even better than Baby Legs because you don't need to add separate socks. Or if you prefer leggings you could cut off the feet. You don't really need to hem them - the ribbing seems to hold OK along the bottom, in a kind of bootleg cut. I just found your blog via Toxteth, its full of great ideas. Thanks for sharing. Hi Debbie! 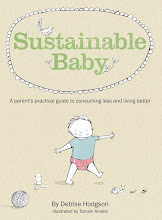 I have just purchased your book and what to commend you on such a practical, informative and eco-friendly resource. I am practicing as many simple and earth friendly methods in my day to day life and this little book has lots of ideas for when my third child is born in the new year. I love these leggings-so easy to make to sew or knit yourself!